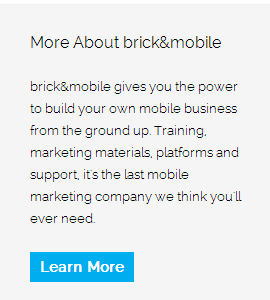 By using any brickandmobile.com web site, mobile website, web platform, product, marketing material, sales training course, subscription, and/or service (“Service”), of brick&mobile, a division of Axiom Marketing Inc. (“brick&mobile”), you are agreeing to be bound by the following terms and conditions (“Terms of Service”). These Terms of Service shall serve as an agreement (the “Agreement”) between brick&mobile and the Mobile Reseller (“Customer” or “You” or “Your”), hereafter collectively referred to as the parties (“Parties” or “Party”). brick&mobile reserves the right to update and change this Agreement from time to time without notice. You can review the most current version of this Agreement any time at: http://www.brickandmobile.com/terms/. You must provide Your legal full name, a valid email address, payment details, and any other information requested in order to complete the registration process. You are responsible for all trade-marks, logos, design, media, text, graphics, animations, audio components, video components, photos or any other information (hereinafter collectively referred to as “Content”) posted and activity that occurs under Your Service (even when Content is posted by others who have access to Your Service). You must be a human. Service registration or access by “bots” or other automated methods are not permitted. Violation of any of the terms will result in the termination of Your Service. While brick&mobile prohibits such conduct and Content on the Service, You understand and agree that brick&mobile cannot be responsible for the Content posted on the Service and You nonetheless may be exposed to such materials. You agree to use the Service at Your own risk, and to hold brick&mobile harmless for any loss, misconduct, or unauthorized use of the Service. If any unauthorized use occurs, brick&mobile may hold You or any party that You have assigned liable for any loss or damage that are a result of the breach of this Agreement. You are responsible for maintaining the confidentiality of Your Service password, and are responsible for all activities that occur under Your Service. You agree to immediately notify brick&mobile of any unauthorized use of Your password or Service or any other breach of security, which includes but is not limited to computer viruses, trojan horses, spyware, malware, adware, hacking, and other malicious or unwanted means expressly or impliedly prohibited by, or inconsistent with, any provision of this Agreement. brick&mobile reserves the right to revoke access to the Service, at its sole option and discretion and without notice to You, if any misuse or foul play occurs or is suspected within the system. brick&mobile will not be liable for any loss or damage arising from Your failure to provide us with accurate information or to keep Your password secure. brick&mobile will charge You a monthly fee for the Service which will vary with the type of plan and actual Service rendered by brick&mobile. All fees are subject to change at any time. We will notify You in advance of any fee changes. brick&mobile shall not be liable to You or to any third party for any modification, price change, suspension or discontinuance of the Service. From time to time, brick&mobile may issue an update to the brick&mobile application which may add, modify, and/or remove features from the Service. These updates may be pushed out automatically with little or no notice, although brick&mobile will attempt to notify You in advance of an upcoming update, including details on what the update includes, whenever possible. A valid credit card or PayPal account is required to set up any type of Service with brick&mobile. By using any brick&mobile’s Service, You hereby authorize brick&mobile to draw monthly automatic recurring payments from Visa, MasterCard or PayPal, covering all monthly dues and all other applicable payments to Your Service. All subscriptions to any brick&mobile Service will renew automatically on a month-to-month basis, and monthly recurring payments, where applicable, will continue until notice of cancellation is received. All fees are exclusive of all taxes, levies, or duties imposed by taxing authorities, and You shall be responsible for payment of all such taxes, levies, or duties. brick&mobile reserves the right to revoke access to Services if Your balance is overdue or invoices are not paid in full. If for any reason You default on Your contracted payment obligations, You hereby authorize brick&mobile or its assignee to collect the outstanding monies, plus service charges and interest, in any method available to brick&mobile. You shall indemnify brick&mobile for all collection or legal fees incurred by brick&mobile in order to satisfy Your payment defaults. There will be no refunds or credits for setup fees, partial months of Service, upgrade/downgrade refunds, or refunds for months unused with any Service. You are solely responsible for canceling Your Service. You can cancel Your Service anytime by clicking on the “Billing” tab inside the Service web platform. Your brick&mobile membership will continue in effect unless and until You cancel Your membership or we terminate it. Any questions in regards to cancellations should be directed to support@brickandmobile.com. Cancellations by phone or sent to any other email address will not be accepted. You may cancel this Agreement at any time after all obligatory payments have been made to brick&mobile, following which brick&mobile shall not be required to render any further Service as per the terms of this agreement. brick&mobile, at its sole discretion, has the right to suspend or terminate Your Service and refuse any and all current or future use of the Service, or any other brick&mobile Service, for any reason at any time. brick&mobile reserves the right to refuse Service to anyone for any reason at any time. In the event of a cancellation and/or termination of Your Service, brick&mobile will not be held responsible or liable for any damages that You or Your clients incur as a result of any agreements made between You and Your clients. Upon expiration or termination of this Agreement: (a) You shall return or, at brick&mobile’s request, destroy all confidential informationf, and (b) other than as provided herein, all rights and obligations of each Party under this Agreement, exclusive of the Service, shall survive. Upon dissolution brick&mobile agrees to provide all Content and necessary information, including client contact details and existing contracts, to transfer Your clients’ accounts so that they may maintain Service with brick&mobile. Upon dissolution of Your subscription, brick&mobile agrees to take over all of Your clients’ accounts and maintain them from the effective date of termination. brick&mobile will host Your Service with a premium Internet hosting provider. You will be granted access to Your Service from our website (http://www.brickandmobile.com), and any sub-domains associated with the particular Service. brick&mobile will make reasonable efforts to monitor the up-time of the hosting account, but does not guarantee or warrant its reliability due to various external Internet factors. Under the terms of this Agreement, all paying customers of brick&mobile will receive exclusive access to a secure members area (“Members Area”) that can be found at http://www.brickandmobile.com/members/ . Information shared in the Members Area is copyright of brick&mobile and must be kept confidential at all times. You may not share or sell any information to business owners, package or offer this information as a bonus, add this information to membership sites, or otherwise distribute this information without written consent from brick&mobile. The trademarks, logos, and service marks that are displayed in Members Area information are the registered and unregistered marks of their respective owners. brick&mobile reserves the right to revoke access to the Members Area at any time if any misuse or foul play occurs, or if unauthorized file sharing or multiple-IP logins are detected in the system. brick&mobile will make the best efforts to respond to all reasonable requests in a timely manner. You understand that brick&mobile will not be held liable for any loss or misfortune that may occur from support or technical recommendations, or the time at which it may take for the support or technical issue to be addressed. We claim no intellectual property rights over the material You provide to the Service. Your profile and materials uploaded remain Yours. However, by using the brick&mobile application to create Your mobile application, You agree to allow others to view and share Your Content. brick&mobile does not pre-screen Content, but brick&mobile and its designee have the right (but not the obligation) in their sole discretion to refuse or remove any Content that is available via the Service. You shall be solely responsible for securing and paying for all digital Content licenses and any other Trademark or Copyright licenses from Content owners (or their agents) required in connection for You to use in connection with the brick&mobile Service. brick&mobile encourages the use of its Service through free trials, when available. Free trials last for 30 days and are only available to first time customers of brick&mobile. Only one free trial may be redeemed per member. A valid credit card or PayPal is required when signing up for a free trial, but You will not be billed until the conclusion of the stated free trial expiry date. By registering for a free trial, You authorize brick&mobile to bill You for the following month of Service at the commencement of that month. If You cancel Your Service prior to the expiration of Your free 30 day trial, You will not be charged. At the end of Your 30 day trial, billing will begin automatically for each month that You continue to use the Services. brick&mobile does not warrant that (i) the Service will meet Your specific requirements, (ii) the Service will be uninterrupted, timely, secure, or error-free, (iii) the results that may be obtained from the use of the Service will be accurate or reliable, (iv) the quality of any products, Service, information, or other material purchased or obtained by You through the Service will meet Your expectations, and (v) any errors in the Service will be corrected. You expressly understand and agree that brick&mobile shall not be liable for any direct, indirect, incidental, special, consequential or exemplary damages, including but not limited to, damages for loss of profits, goodwill, use, data or other intangible losses (even if brick&mobile has been advised of the possibility of such damages), resulting from: (i) the use or the inability to use the Service; (ii) the cost of procurement of substitute goods and services resulting from any goods, data, information or services purchased or obtained or messages received or transactions entered into through or from the Service; (iii) unauthorized access to or alteration of Your transmissions or data; (iv) statements or conduct of any third party on the Service; or (v) or any other matter relating to the Service. brick&mobile will have no liability for any damage, loss of productivity, or loss or alteration of matter detrimental to Your client’s property due to the use of third-party software or hardware installed or recommended by brick&mobile. You represent and warrant that any Content provided to brick&mobile so that brick&mobile may carry out the terms of this Agreement does not violate the rights of any third party, whether arising by agreement or by operation of law. You hereby (i) grant to brick&mobile a license to use any such works or intellectual property attaching to such works ; and (ii) waive any and all moral rights in association with any such works provided to brick&mobile. You further represent and warrant that such license and waiver of moral rights does not violate any rights of any third party. You agree to indemnify, save and hold harmless brick&mobile from any and all damages, liabilities, costs, losses or expenses arising out of any claim, demand, or action by a third party arising out of any breach of Your responsibilities or obligations, representations or warranties under this Agreement. You waive any claim for damages of any kind or nature against brick&mobile and agree that Your sole and exclusive remedy for damages (either in contract or tort) is the return of the price paid to brick&mobile limited to a total value of $1,200. Customer shall own and retain all rights to the Content provided by Customer, which includes all Content. brick&mobile shall own all rights, title, and interest in and to all other elements, materials, data, graphics, and code of the Service including all interfaces, navigational devices, menus, menu structures or arrangements, icons, help and other operational instructions, and all other components of any source or object computer code that comprise the Service, all literal and non-literal expressions of ideas that operate, cause, create, direct, manipulate, access, or otherwise affect the Service and design elements. You shall not do anything that may infringe upon or in any way undermine brick&mobile’s right, title, and interest in the Service or any other intellectual property held by brick&mobile. brick&mobile reserves the right to display any portion of Your publicly available Service for the purpose of displaying rendered work to other potential customers or for marketing purposes. Each Party acknowledges that in connection with this Agreement it may have access to proprietary information of the other Party, including but not limited to trade secrets, data, processes, technical information, business knowledge, pricing, service providers, hosting providers, technology partners, research and development and marketing strategies (hereinafter collectively referred to as “Confidential Information”). You acknowledge that the disclosure of Confidential Information in any manner would be highly detrimental to the interest of brick&mobile. You agree that the right to maintain such Confidential Information constitutes a proprietary right, which brick&mobile is entitled to protect. Accordingly, You, Your agents and Your employees agree that they cannot disclose or permit (either during this Agreement or thereafter) the disclosure any Confidential Information to any person, or use or permit the use of same, for any purposes other than those of the owner of such information. You shall not use any Confidential Information of brick&mobile except as may be necessary to perform your respective obligations under this Agreement. Notwithstanding the foregoing, Confidential Information shall not include any information that is in the public domain or becomes publicly known through no fault of You. You understand that brick&mobile uses third party vendors and hosting partners to provide the necessary hardware, software, networking, storage, and related technology required to run the Service. You must not modify, adapt or hack the Service or modify another website so as to falsely imply that it is associated with the Service, or any other brick&mobile Service. You agree not to reproduce, duplicate, copy, sell, resell or exploit any portion of the Service, use of the Service, or access to the Service without the express written consent by brick&mobile. Verbal, physical, written or other abuse (including threats of abuse or retribution) of any brick&mobile customer, employee, member, or officer will result in immediate Service termination. brick&mobile may assign all of its rights, interests and obligations pursuant to this Agreement to any person or Company without Your consent. You shall not assign or transfer any of Your right or obligations pursuant to this Agreement without the prior express written consent of brick&mobile. This Agreement shall be governed by and construed in accordance with the laws of the Province of Ontario, Canada. The failure of brick&mobile to exercise or enforce any right or provision of this Agreement shall not constitute a waiver of such right or provision. This Agreement constitutes the entire agreement between You and brick&mobile with respect to the subject matter hereof and cancel and supersedes all prior and contemporaneous agreements, understandings, negotiations and discussions, whether oral or written (including, but not limited to, any prior versions of this Agreement) between the You and brick&mobile with respect thereto. Questions about the Terms of Service should be sent to support@brickandmobile.com.